Hard to believe that this is real. It seemed like a combination of an Escher illusional print and the government hall where Queen Amydal addressed the Galactic Senate in Star Wars, The Phantom Menace. So mysterious, beautiful and somehow sinister at the same time. This is actually closer to Jaipur. It's in a small town called Abhaneri, 95km west of Jaipur on the road to Agra. 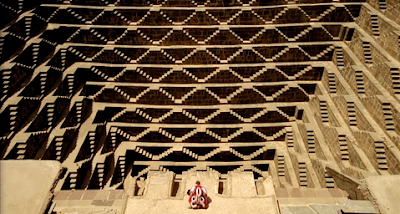 It is called Chand Baori. Surprisingly, it's in the Lonely Planet guide for Rajasthan, but it's not a place most drivers know how to find. If you want to visit, you'll have to ask around for directions -- but it's totally worth it! Thanks! I've updated the post title to change the location. This is so great! Thanks for posting i very much enjoy all the locations. It was something i kept wondering myself after watching this fantastic film. i saw in the credits that some was shot in chile and brazil. do you know which parts they were? this look unbelievable. when i first watched this scene i have to pause to see if there is any effect involved. i'm dumbfounded when it didn't. the fall probably the most under-appreciated most beautiful film the world has ever seen. Thankyou! I was searching like crazy for this location. i think they mentioned the places in the end credit of the movie if im not mistaken. or probably it was just the name of the country involved. not too sure. I believe the same monsoon well is featured in the "Water" episode of "How the Earth Changed History". By coincidence, I saw this episode the night before I first saw the film. Great thanks for pinpointing all those gorgeous sites in the film!